The policy may be almost 200 years old, but it remains as relevant as it is impolitic. Predictably, these comments spurred international criticism, particularly in Latin America, where the Monroe Doctrine is often seen as an outdated, neo-colonial imposition. In fact, Tillerson wasn't necessarily wrong -- although he should have known that some truths are better left unsaid. The Monroe Doctrine, which was originally formulated in 1823 by John Quincy Adams (President Monroe's secretary of state), traditionally rested on two pillars. The first was that Washington could not tolerate another great power having a geopolitical foothold in Latin America because of the threat that presence would pose to the security of the United States. Over subsequent generations, this concept would motivate the U.S. to drive the European powers out of Latin America, and then to prevent American enemies -- namely Nazi Germany and the Soviet Union -- from establishing or expanding strategic beachheads in the region. The second, and related, pillar was that it would be dangerous if ideologies antipathetic to democracy became dominant. “It is impossible,” Monroe declared, that the European powers “should extend their political system to” the Western Hemisphere “without endangering our peace and happiness.” In the 1820s, the political system in question was monarchy; in the 1900s, the focus would shift to totalitarianism. But for 200 years, this basic idea represented half of the doctrine's intellectual core. To be clear, this did not mean that America would always support the spread of democracy in Latin America. Monroe made clear in 1823 that the U.S. would not interfere with existing European colonies in the Americas. Over the next 150 years, the U.S. would promote Latin American democracy only intermittently, and it often put the demands of security ahead of those of political liberalization. But the doctrine did mean that Washington could not allow the ideologies of its greatest foreign enemies to spread in America's strategic “backyard” without endangering U.S. safety and influence. Although expressing these ideas today may be impolitic, they remain quite relevant. Were China or Russia to establish a major military or geopolitical presence in Latin America, the U.S. would surely find its security posture compromised: Washington would have to devote far more resources and attention to protecting its southern flank and less to projecting power overseas. Moreover, the spread of hostile ideologies will only compromise American influence in the region. In recent years, for instance, the rise of radical populism in Venezuela has led to confrontation with the U.S. and facilitated encroachments by China and Russia. In other words, Americans may largely have stopped thinking about geopolitical and ideological competition in Latin America, but the imperative of winning such a competition should it emerge remains no less pressing than it was during the Cold War. Indeed, at a time when China and, to a lesser extent, Russia are increasing their presence and sway in the region -- another fact Tillerson noted in his speech -- the Monroe Doctrine seems increasingly relevant. The other basic truth in Tillerson's remarks is the idea that the Monroe Doctrine has largely been a success. This is undoubtedly true from a U.S. perspective: America has benefited enormously from maintaining its dominance in the Western Hemisphere. It is more controversial -- but also partially true -- to note that Latin America has also benefited from the doctrine. The promulgation of the doctrine helped Latin American countries protect their independence from European re-colonization in the 19 th century, although here Washington had to share the credit with Great Britain, which -- for its own selfish reasons -- played an essential role in enforcing Monroe's edict in its early decades. In the early 20 th century, the Roosevelt Corollary to the Monroe Doctrine helped ensure that small Caribbean nations did not lose their independence to European interventions, albeit sometimes at the price of temporary U.S. military occupation. Under the intellectual aegis of the Monroe Doctrine, the U.S. also took critical steps to limit Nazi influence in Latin America before and during World War II, and to check the spread of Soviet and later Cuban influence during the Cold War. All of this came with real and sometimes severe costs for Latin American countries, from the military interventions that Washington undertook to the support it provided for ruthless anti-communist regimes. And for Latin Americans, the Monroe Doctrine is often associated with U.S. heavy-handedness and Latin American humiliation. Yet if these costs are undeniable, it is hardly clear that Latin America would have been better off had another power -- particularly an authoritarian one -- become the primary outside actor in the region. Since the late 1970s, moreover, the United States has often used its preponderant influence to support the spread of democracy, something it is hard to imagine any of America's great-power competitors doing. There is, then, something to Tillerson's argument. The problem -- a common one in this administration -- is that this hint of geopolitical insight also revealed two glaring problems in American diplomacy. First, although Tillerson was right to flag the challenge posed by China's growing influence in Latin America, this administration has shown little ability to strengthen or even defend America's own position. Instead, Washington is retreating from its leadership of a global trade system that many Latin American countries count on to pull them to a higher stage of development, even as China is disingenuously touting its own commitment to globalization. And by enfeebling the State Department, Tillerson is undercutting the diplomatic expertise needed to compete. The secretary has also proposed few promising initiatives to reduce the increasingly glaring disparity between the resources and attention that Beijing has been pouring into Latin America and the low priority the U.S. has given the region. Finally, the president's anti-immigrant rhetoric, his insulting attitude toward Mexico and his threats to withdraw from Nafta aren't winning Latin American favor. Indeed, given that leaders in Mexico and other countries are talking about turning to China as an alternative to Trump's America, administration policies would seem thoroughly self-defeating. The second problem is that there are some things U.S. officials shouldn't say publicly, even if they happen to be accurate. 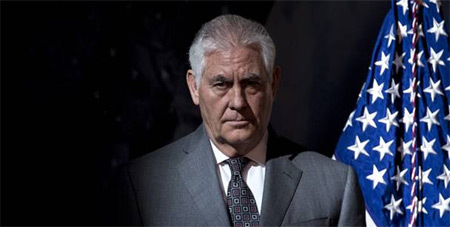 Tillerson's predecessor declared in 2013 that the era of the Monroe Doctrine was over because Latin American countries do not like to be reminded of the dominance that the sometimes-overweening American colossus has traditionally wielded in their backyard. The United States doesn't need to apologize for most of the actions it has carried out in the name of the Monroe Doctrine. But as any good secretary of state ought to know, sometimes mouthing diplomatic platitudes is smarter than stating blunt truths. Hal Brands is the Henry A. Kissinger Distinguished Professor at the Henry A. Kissinger Center for Global Affairs at Johns Hopkins University's School of Advanced International Studies and a senior fellow at the Center for Strategic and Budgetary Assessments. His latest book is "American Grand Strategy in the Age of Trump." Petroleumworld does not necessarily share these views. Editor's Note: This commentary was originally published by Bloomberg on February 6, 2018, 2018. Petroleumworld reprint this article in the interest of our readers and does not necessarily reflect the opinion of Bloomberg LP or Petroleumworld and its owners. Internet web links to http://www.petroleumworld.com are appreciated.Copyright© 1999-2017 Petroleumworld or respective author or news agency. All rights reserved.